Ron Skaggs did the carving of the blade and handle. 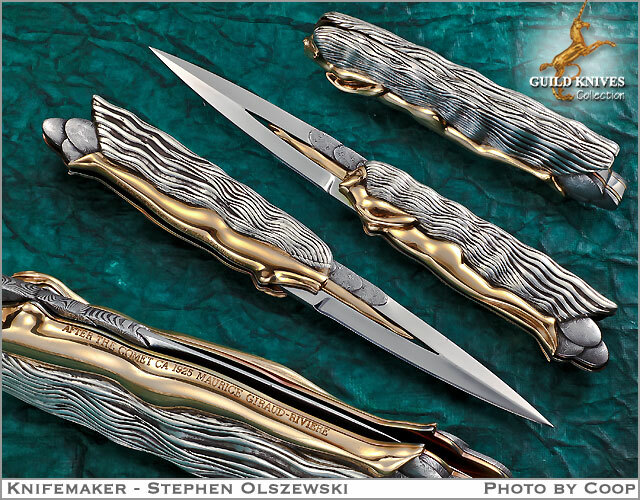 Gold was 1/6 or the price that it is today and Ron loaded this knife with a fully sculpted figure of the flying woman. There is so much solid gold that was used to carve the womanâ€™s body, that upon picking the knife up, one wonders where all the weight comes from. This is a 7 ounce knife and huge amount of the weight is from the gold. There has never been a finer authentic Art Deco knife. Rados Turkish Twist incised with 18K gold arm inset.